This surprising and delightful little wildflower grows in open woodlands where it is in partial shade only. 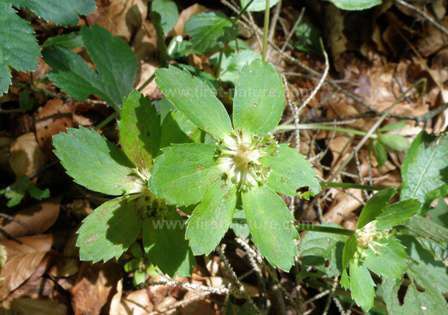 Haquetia epipactis is a low-growing plant with a creeping habit. Its basal leaves are somewhat rounded and the tiny yellow flowers form an umbel in the centre of a ring of bright green bracts that look very much like petals. Its territory in Europe is Austria, Poland and Slovenia. Haquetia usually flowers from April to July.